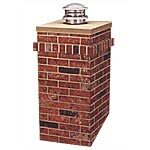 At FireplaceEssentials we carry all the chimney supplies that will get the job done in any situation and we can help with it. 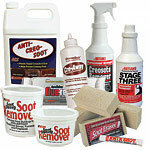 We have different chimney cleaning tools that make any cleaning job easier and more efficient. Our chimney brushes and rods range from the heavy duty selection for large masonry chimneys to our proflex chimney rods and the sweeps all chimney brushes, which come in a variety of sizes. These brushes and rods are flexible so they can be bent and pushed through small openings where traditional brushes and rods cannot. We also offer complete chimney cleaning kits including both the chimney brush and chimney rods Many of our customers ask us if they can clean the chimney from the bottom and avoid going up on the roof or ladder. For fireplaces, if the damper bisects the bottom of the chimney in half the proflex rods and sweeps all brushes can be used. The SweepsAll brushes are soft and oversized so they can be pushed past the damper and will then pop back open to clean the flue. 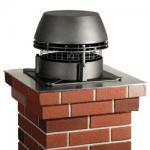 How often your chimney needs to be cleaned depends on several factors. The type and quality of wood burned, how often it is being used and if it is a fireplace or woodstove. The combination of these factors determine the amount ot leftover carbon molecules from the wood that failed to get burned and rise up on the hot air in the chimney. Using a strong spotlight, look up or down the flue to determine the level of creosote in the chimney. 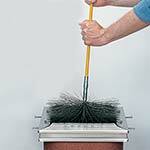 If it is a dusty, soft and grayish/black buildup it can be easily removed with the proper sized chimney brush. On the other hand, if it is hard, black and shiny, it will be more difficult to remove and will require our prokleen chain system or a special spray-on powder that helps turn the tough black glaze to a more brittle state. 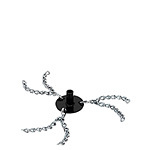 It can then be removed with one of our flat wire heavy duty brushes. Chimney cleaning is fairly simple. You attach a series of rods to the brush to lengthen it as you proceed up or down the chimney. Cleaning is best accomplished with short, forceful, plunging motions, which will allow the brush to do its job. 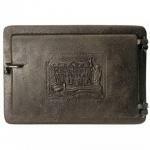 When performing the cleaning from the interior of the house, we suggest our hearth country ash vacuum to help control the dust. FireplaceEssentials carries hand brushes come in many different shapes and sizes and each serves its own purpose. The curved handle wire brush comes with our kits and is a great chimney brush for cleaning in between tight spaces and has strong wire bristles. The scout chimney brush is a great chimney brush for cleaning around the damper and bottom of the flue and has durable poly bristles. The smoke chamber chimney brush is a longer chimney brush for cleaning a couple of feet up into the chimney and has durable poly bristles. The unique noodle chimney brush can be bent to reach into hard to reach places and the milbury brush is an all purpose brush for sweeping up ashes. 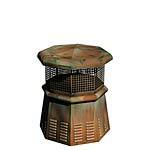 Lyemance chimney damper provides solid, tight-sealing protection to the top of the flue. Traditional throat dampers only give metal to metal contact - notoriously leaky and expensive. 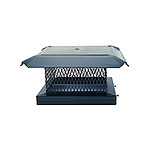 Who can afford heated or cooled air going out their chimney? The lyemance chimney damper is operated by a 35' cable dropped down the chimney with a handle mounted in the firebox (Both Included). Just a tug on the handle will open or tightly close the Lyemance chimney damper. It is also very east to install. 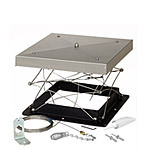 The Lyemance chimney damper has a low profile and is great for installing under chimney covers. Lock-Top Chimney Damper makes a super tight seal with its silicone rubber gasket. 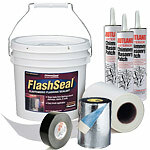 This tight seal can reduce heat loss by 90 percent over even new traditional throat dampers. 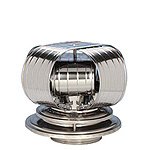 The Lock-Top chimney dampers has a stainless steel lid attached to a cast-aluminum frame by an array of stainless spring wires. It is operated by a 30' cable dropped down the chimney with a handle mounted in the firebox (Both Included). Just a tug on the handle will open or tightly close the Lock-Top chimney damper. Lock-Top II chimney damper combines the engergy-saving features of the Lock-Top Damper with a special stainlesss steel Gelco chimney cap. The Lock-top II comes fully assembled. The base mounts to the included sweep's ring which attaches to the flue with silicone sealant which is also included. A 30' stainless steel cable (included) drops down the flue, and a hardware set (included) mounts in the firebox. The Lock-top II has a lifetime warranty and is available in 3/4" and 5/8" mesh.All of these chimney dampers include everthing for an easy installation and operate easily with a tug on the handle to open or tightly close.Free fast shipping and guaranteed price. Any Chimney Damper purchased from FireplaceEssentials will withstand the elements and will have high quality construction. FireplaceEssentials customers always enjoy the added confidence of knowing that our 30-day money back guarantee demonstrates our commitment to complete customer satisfaction. 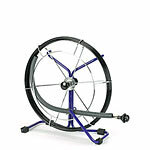 Another advantage of ordering from us is our prompt delivery policy. 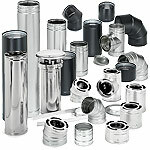 Most chimney dampers are shipped the same day they're ordered and for free if the order is over $ 100.